Let’s take a closer look at the Curl Therapy range this week. Discover how this curl-enhancing shampoo will aid your style and swiftly become a must-have in your shower. Enriched with vitamins such as panthenol (vitamin B5) and magnesium (vitamin B6), this shampoo is highly concentrated with strengthening and repairing properties. It deeply penetrates the hair shaft to nourish and hydrate beyond the surface. Hair feels stronger, appears shinier and reflects the light beautifully. 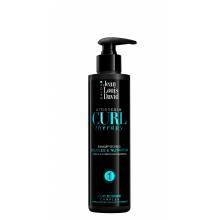 What’s more, it defines curls and keeps them bouncy all day long. This super-nourishing formula has been designed with dry hair in mind and makes tangles a thing of the past. Whatever the shape of your curls, Curl Therapy is perfect for all hair types and will enhance your natural waves in next to no time. Its silicone and paraben-free formula features a light, fresh scent which will leave your hair smelling fragrant all day. Its lightweight, non-greasy consistency foams into a luxurious lather when applied. This is the perfect moment to give yourself a scalp massage to boost circulation and treat yourself to a moment of luxury. Use two to three times per week and follow with the Leave-In Curl and Definition to keep your style looking great 24/7.